Sometimes when two worlds collide, a better one is created. The quote above creates visual image in my mind of cyclonic winds converging and leaving an altered landscape in its wake. This is probably due to events I have personally witnessed. I have observed the literal convergence of air masses three times in my lifetime. The first time was when I was a young child on a farm and I witnessed a tornado developing in the next county over. It was a frightening sight. The second was as a teenager on the beach gazing out into the Atlantic with my best friend when an afternoon waterspout formed. Even though we spent some portion of every day on the strand, we had never seen that happen before. It was scary but magnificent. The third was as an adult with my two, young children in the car. A tornado formed on 10th Avenue in Myrtle Beach and made its way up the street looking like an angry, drunken miasma. The swirling winds sucked up debris that looked like a swarm of angry bees or perhaps bats. The scene caused me to gasp aloud, “What is that?” which served as no great comfort to my children. One began to scream at full throttle and one fell into the floorboard of the car and began to pray aloud in earnest. It seems to me that school systems across the country are witnessing a convergence of gale force winds. Winds of a stationary front representing the system that has been, and the winds of change from the movement that is on the horizon. The movement on the horizon is one that is being fueled by leveraging tools that can personalize education. This is a movement towards competency-based systems that do not sort children like batches of cookies. This is a movement that is sure to cause much angst on the part of internal and external stakeholders even if planned and implemented well. It is a movement that causes a fundamental change in how schools in this country are organized, and it is a fundamental change that the leaders in this country did not experience during their own school careers. For the past two days I spent most of my time in Whittemore Park Middle School (WPMS) learning more about the work underway at this Next Generation Learning Challenges Grant School. Whittemore Park, located in Conway, SC, is in its second year as serving as an incubation site for taking blended learning to scale in Horry County Schools. The grant award coupled with the leadership of Judy Beard, the principal, and Beth Havens, lead innovator, have placed this school in the position to be one year out ahead of the rest of the system. The school serves as the test site and think tank for the blended learning work that the school system is attempting to take to scale for its 41,000 students. Spending time in this school is motivational and uplifting. The school is filled with teachers and staff who genuinely care about students. It is surrounded with community support that ranges from the Conway City Council and mayor to several community and business leaders who care deeply about the school and its children. 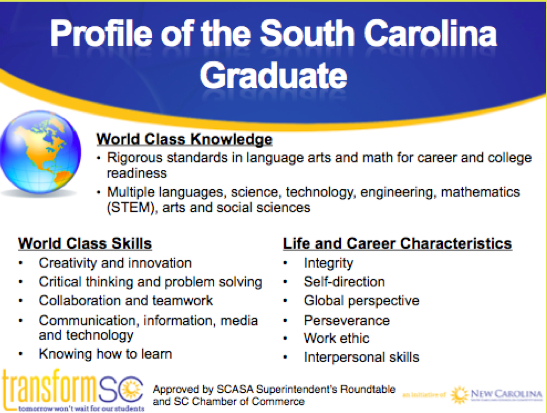 Partnerships with groups such as EPIC, Education Elements, Horry Georgetown Technical College and Coastal Carolina University, TransformSC and the Riley Institute all assist the school in serving students in ways that are not possible with just school system support alone. 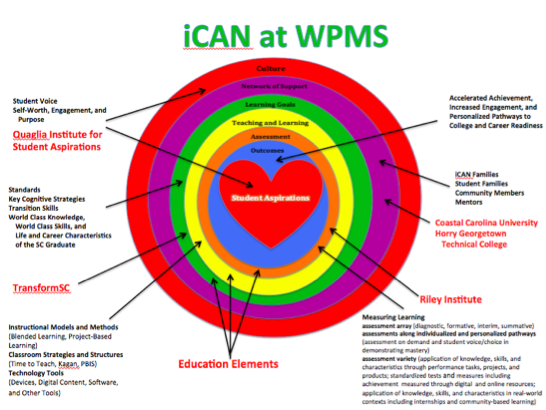 iCAN at Whittemore Park Middle School has in its goals individualized instruction, college and career readiness, student aspirations, and a network of supports for students. By focusing on these components the school will be poised to ensure its children are prepared to be contributing members of society. A visual representation of this work appears below. You are probably wondering why I am describing all the positive aspects of this initiative in a blog that begins with a quote about worlds colliding. Yes, there is really good, innovative, life-changing work going on at Whittemore Park Middle School. The inevitable collision is due to the current South Carolina Accountability System that focuses almost exclusively on academics and a grade level-specific structure rather than emphasizing student growth. The collision of air masses in the waterspout I witnessed as a teenager impacted the ocean. Thank goodness, it never moved onto the land that day. The winds of change brewing now in public education in this state will primarily impact our teachers. That is a huge impact! Teachers in South Carolina are in the midst of teaching in a state making the transition to a new teacher evaluation system. The evaluation system is being implemented at the very same time that a new grades 3-8 summative, student assessment is being put into place. (Interestingly enough, that assessment as of tonight, Thursday, September 18, has not even been named.) We are keeping our fingers crossed that the announcement regarding the assessment is going to be made tomorrow. In summary, Whittemore Park Middle School teachers and other teachers in South Carolina who are trying to implement blended learning to better personalize education for the Palmetto State’s students are working in the convergence of air masses. They are totally revamping how they do school and working to develop the blueprint and figure this out while the parameters of the accountability systems are not aligned with where they are trying to go. 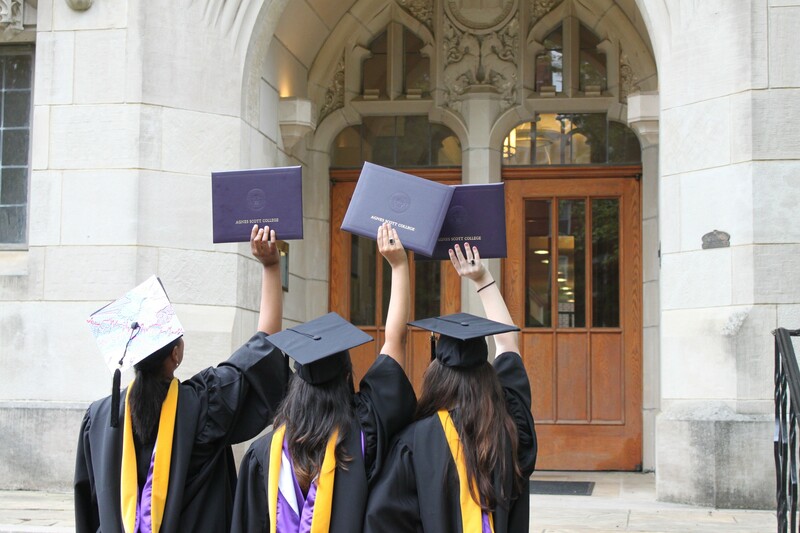 We are hopeful that groups such as the EOC, The Riley Institute at Furman University, and TransformSC can work to provide a supportive environment for them to do their work. Teachers are literally working in one world built on old, outdated paradigms while trying to transition to a new instructional world that better meets the needs of their students- but one that while better for students may not currently align perfectly with the accountability systems. The teachers in Whittemore Park and in this state deserve a supportive, safe shelter out of the winds until the transition to the new world is complete. 2) The implementation of SLOs has been delayed until the start of the 15-16 school year. Dr. Zais is in the process of crafting a memo to all superintendents about this issue.